Earlier this month, I received an email from the university about my registration date for courses: June 17th at 9:30am. I already have my alarm and backup alarm set to ensure I am up in plenty of time with my schedule in hand so I can register for the courses I want to take as soon as possible before they fill up. I know I can always change them but I have a huge fear of not getting into classes. 1. Make a list of all the required courses and block them in first. I am guilty of this, but sometimes I schedule in electives that I really want to take before I block in required courses I have to take for my degree. However, some required courses may only be offered at certain times or in certain terms and should be planned around before electives that could be taken anytime. 2. Leave yourself some time in between. Typically, classes are scheduled so that there is 10 minutes to travel between them, but it is so not ideal if you have to sprint across campus to get to your next class. To avoid this, I like to note the building the class is located in so that I can plan classes close by immediately following. Personally, I like having blocks of time in between classes for readings, homework, and relaxation, but for other people it is best to have all their courses back-to-back so they can head home immediately after. 3. Work around your schedule, not your friends’. I love being in classes with my friends as much as anybody, but at the same time, my schedule comes first. If I can be in a class with a friend that works for me, then that’s great, but I don’t want to rearrange my entire schedule so we can be in the same class. If you take the bus or other modes of transport to school, consider how long it will take you to get to school and what a realistic start time is. For instance, I try to avoid 8:30am classes because it is no fun waking up at 5am to get an early bus to campus. Many course outlines from previous terms can be easily found through a quick Google search. This is especially helpful if a course is offered by multiple professors. Rate My Professors is a great way to research which professor might be best for you, and a previous course outline from their class will indicate how they like to allocate marks. I am someone who likes having my grade come from multiple sources: assignments, online quizzes, in-class participation, and exams. For others though, three exams and a final is just fine. But a mix of both types of courses makes for a manageable workload. 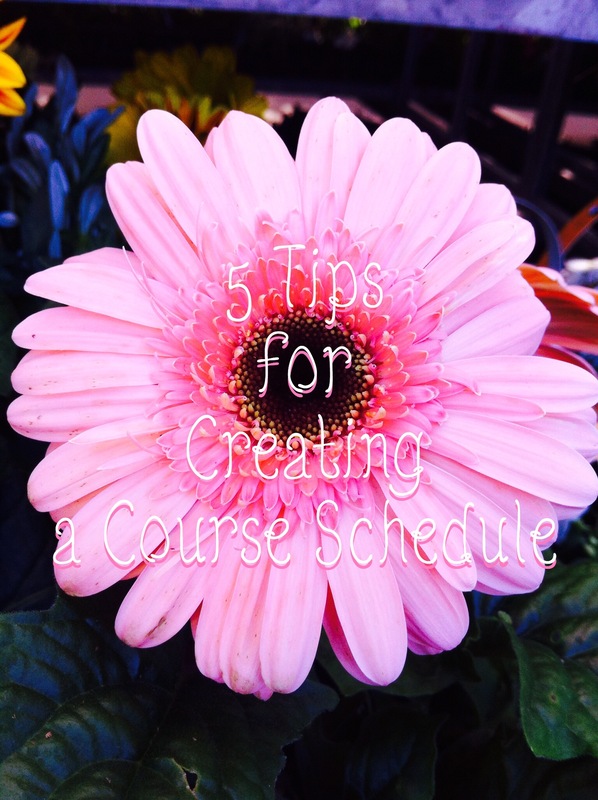 What are some of your tips for mapping out a course schedule?? ?